The Ramsey lab combines molecular analyses, garden studies, and field experiments to address questions about ecological adaptation and speciation in flowering plants. We are particularly interested in polyploidy -- whole genome duplication -- and its broader implications for plant ecology and systematics. As is traditional in our area of research, we work on non-model plant species selected on the basis of natural history, taxonomic interest, and amenability to experimental manipulation. Our work has recently been supported by a S. Dakota Biomedical Research Infrastructure Network Faculty Fellowship (NIH IMBRE; 2016-2017), the National Science Foundation (CAREER award; 2010-2015), and a University of Rochester Provost Award for Multidisciplinary Research (2008-2010). In addition to research in evolutionary ecology, the Ramsey lab leverages skills in field sampling and plant identification to conduct conservation-focused work in forest and grassland habitats. These efforts have recently focused on questions about stand structure and tree recruitment in remnant old-growth, as well as trail building, eradication of exotics, and community outreach. Summaries of ongoing projects are provided below. WILD YARROW. Achillea borealis (Asteraceae) is a complex of ecological races occurring in diverse climatic and edaphic conditions throughout North America. The species is notorious for its taxonomic complexity, incidence of polyploidy, and profound degree of local adaptation. Our studies have three foci. 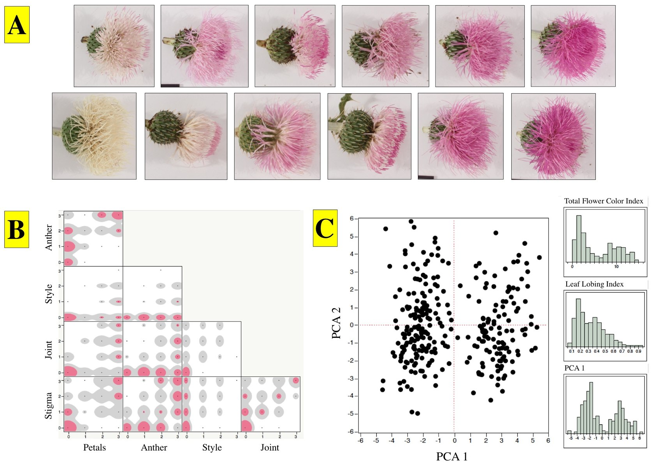 (1) Characterization of population genetic structure and historical relationships in the circumpolar Achillea millefolium aggregate, using DNA sequence data (cpDNA, nrDNA, low copy nuclear genes) and molecular markers (AFLPs, microsatellites). (2) Evaluation of autopolyploidy as mechanism of adaptive divergence and incipient speciation, based on experimental comparisons of naturally-occurring polyploids (“established” polyploid populations) vs. neopolyploids (spontaneous polyploid mutants screened from progenitor populations). (3) Analysis of the phenotypic and genetic basis of ecological adaptation within established polyploid lineages, inferred from physiological measurements, classical genetic methods (segregation of traits in experimental hybrid pedigrees), and candidate genes approaches. ENGLISH IVY. Ivy (Hedera spp, Araliaceae) is a polyploid complex of woody vines native to Eurasia but cultivated worldwide for its attractive foliage, hardiness, and ease of propagation. Ivy is also a serious pest in forest environments along the Atlantic Seaboard and Pacific Coast of North America. Despite its horticultural value and ecological impacts, the systematics and invasion biology of ivies are poorly understood. Our work involves four major components. (1) Resolution of Hedera phylogeny based on DNA sequence data (cpDNA, nrDNA, low copy nuclear genes) and molecular markers (microsatellites). (2) Analysis of the taxonomic composition and population genetic structure of invasive ivy populations in North America. (3) Evaluation of the relationship between polyploidy and invasiveness, inferred from field surveys and common garden experiments with the sister species H. helix (diploid) and H. hibernica (tetraploid) as well as induced “neopolyploid” genotypes. 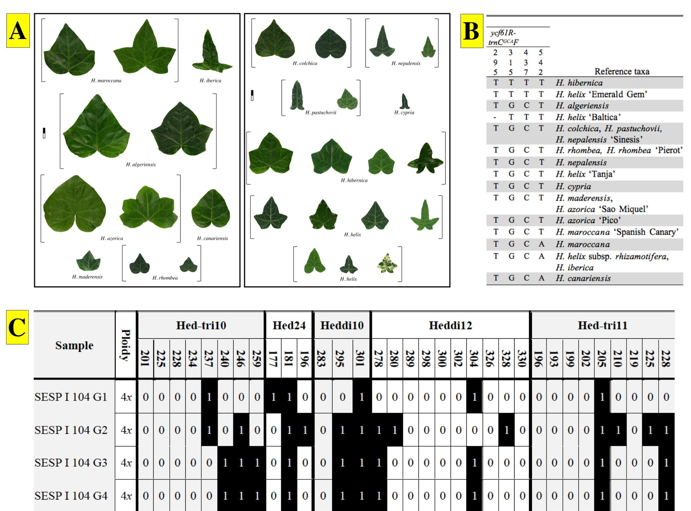 (4) Characterization of fruit dispersal and recruitment dynamics in naturalized ivy populations, and the utility of cultivating sterile triploid plants (F1 H. helix x H. hibernica) to reducing forest invasion. CREOSOTE BUSH. Creosote Bush (Larrea tridentata, Zygophyllaceae) is a dominant shrub across the Mojave, Sonoran and Chihuahuan deserts of the southwestern U.S. and northern Mexico. This taxonomic species is comprised of diploid, tetraploid, and hexaploid “races” that replace each other along a longitudinal gradient. We are working on three projects in this system. (1) Characterization of phylogeography and cytogeography of L. tridentata in comparison to its South American relatives, based on DNA sequence data (cpDNA, nrDNA), molecular markers (AFLPs), and flow cytometry. (2) Measurement of pre-zygotic barriers (habitat isolation, phenological isolation) and post-zygotic barriers (triploid block, sterility) isolating diploid and autopolyploid races of L. tridentata, as inferred from field observations and experiments. (3) Analysis of gene flow and morphological boundaries of creosote cytotype populations, and hence their status as biological and taxonomic species. You can learn more about creosote bush research on Dr. Rob Laport’s website. (a) Geographic distribution of the ecological races of Achillea borealis. Wild yarrow ecotypes are distinguished by a number of morphological, phenological and life-history traits. (b) Phylogenetic relationships of the circumpolar A. millefolium aggregate inferred from cpDNA (five noncoding regions). North American populations have a peculiar genetic structure (single major haplotype, numerous minor haplotypes) that suggests recent and rapid demographic expansion. (c) Phylogenetic relationships inferred from AFLPs (1,013 fragments). (Left) Leaf morphology of natural Hedera species, as grown in a common garden environment. Taxonomic identification in naturalized populations is complicated by phenotypic plasticity and occurrence of both ornamental and “wild-type” individuals. 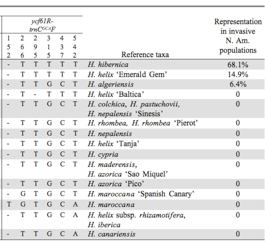 (Right) Partial haplotype table based on noncoding cpDNA (five regions). The vast majority of North American invasives have haplotypes identical to European taxa (diploid H. helix and its sister species, the autotetraploid H. hibernica) and distinct from Mediterranean and East Asian species. The geographic distribution of diploid H. helix and tetraploid H. hibernica in North America mirrors the species’ occurrence in maritime vs. continental climates of Europe, suggesting that the two species may be “pre-adapted” to invade alternate environments. (Left) Spatial distribution of diploid, tetraploid and hexaploid populations (icons) in relation to traditionally-defined floristic boundaries in the North American warm deserts (colored backgrounds). Cytotype distributions correspond roughly to the Chihuahuan (2x), Sonoran (4x) and Mojave (6x) deserts, with regional cytotype co-occurrence in some areas. 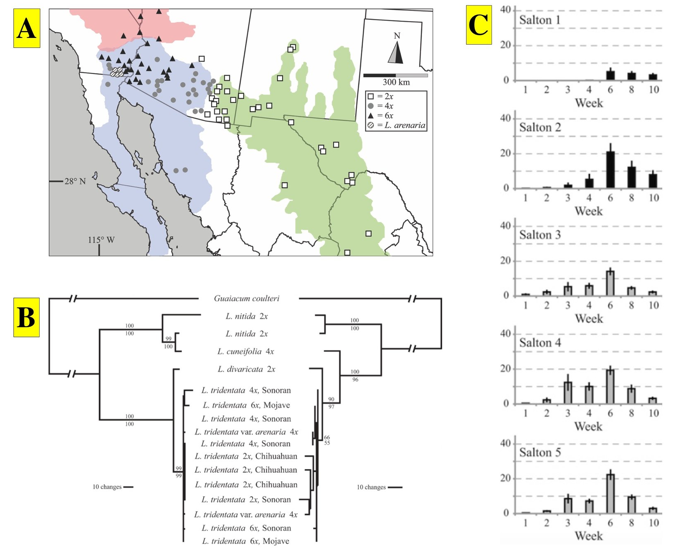 (Right) Creosote bush phylogeography inferred from noncoding cpDNA. The North American creosotes appear to be monophyletic, closely-related to the South American Larrea divaricata, and have undergone a recent and rapid demographic expansion following a long-distance intercontinental dispersal event. FOREST ECOLOGY & CONSERVATION. In addition to its evolution-focused work, the Ramsey lab conducts conservation-focused research in New York’s lakeplain forests. These efforts have four major foci. (1) Identification of old-growth stands using GIS, historical aerial photography, and tree coring. 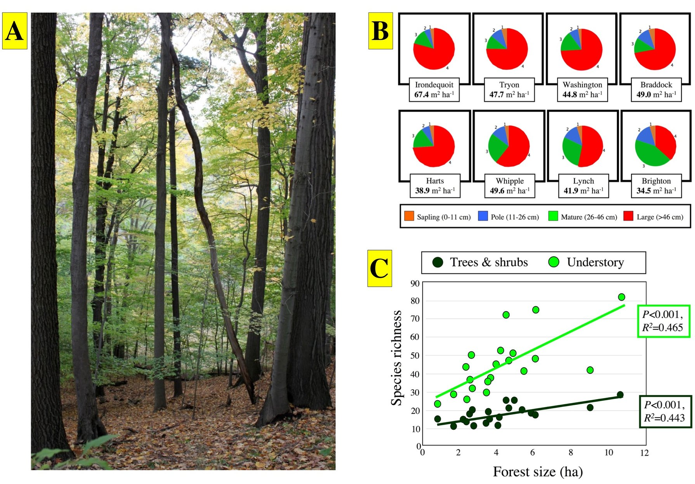 (2) Analysis of canopy tree structure and coarse woody debris loads in old-growth vs. second-growth stands. (3) Characterization of understory plant communities and their association with physiographic and soil features. (4) Evaluation of exotic plant invasion and its association with land-use history. To complement these research projects, the Ramsey lab sponsors education and community outreach efforts focused on Rochester-area remnant old-growth forests. To learn more about these activities, please visit our Rochester Forests and South Campus webpages. Additional information about Ramsey lab research efforts can be found on our Publications, Photos & News, and Rochester Forests web pages. (a) Old-growth forest stand in Durand-Eastman Co. Park, north of Rochester. Located on a steeply sloping hill, this 3.5 hectare site was never deforested or converted to agricultural production, unlike most other parts of the park. (b) Total canopy tree basal area, and contributions of so-called sapling, pole, mature, and large size classes, at eight old-growth sites across Monroe Co. Most of the stands we surveyed have forest structural indices that meet or exceed thresholds for old-growth designation that were developed in more remote areas of eastern deciduous forest. The taxonomic and structural composition of these stands, however, varies substantially from site-to-site. (c) Relationship between stand size and plant species diversity in remnant old-growth areas. While there is a clear statistical association, small stands nonetheless harbor substantial vascular plant diversity.